On July 24th, 2008, our nursery had the extremely dubious honor of being the start of a 50 mile tornado track through the middle of New Hampshire. In the weeks following, Peter, I and the staff were both exhausted and thrilled by over 2000 volunteer hours to get Van Berkum Nursery ‘back on its feet’. 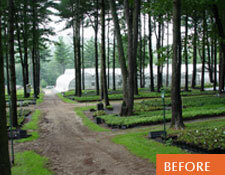 Van Berkum Nursery shipped its first order on the Tuesday after the storm. Here is the story of what happened that Thursday. The tornado began here in Deerfield about noon, bouncing off a couple of hills south of us then beginning its 50 mile track precisely at our nursery. It really did sound like a freight train or 747 jet plane, the sky was instantly black and we frantically called above the roaring sound for everyone to run for the barn. Our hearts sank as we did roll call from the time cards and found that Travis Bibeau was missing, but he staggered up the hill a few minutes later. Little did we know then what he had just been through (see below). 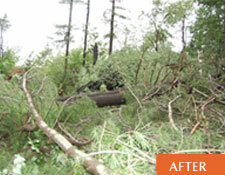 We contacted our arborist, Corin Hallowell minutes after the tornado hit us on July 24th and he helped us mastermind a plan to carefully lift around 200 trees off of the plants in the upper shade areas with two cranes and three logging companies who went to work cutting them up and hauling them away the next day Another logging company, Fort Mountain Logging, went to work on over 500 trees on the other side of the nursery. We pulled our first order and shipped it on Tuesday, amidst the equipment, broken pots and helpers. We cheered the first customer who ventured in to buy plants. In the 10 days after the storm, volunteers from Deerfield, Concord and beyond, landscape companies, and garden centers moved plants to make way for huge equipment, repotted damaged plants, and hauled away endless brush. We had between 40 and 120 people here each day, endless support, hugs, hard work, cold drinks, great lunches and smiles of encouragement. Not to mention a stream of TV and newspaper crews, eager to hear the story of the storm, how miraculous it was that there were no customers and no employees far from the barn because it came upon us without warning. They especially wanted to hear about Travis. He was headed to the part of the nursery that lies on the other side of the marsh, figuring he had about 10 minutes before the ‘thunderstorm’. He suddenly heard a roar, saw trees start to topple and saw a 10 foot wall of water (John Winslow, our neighbor also saw it from his house) heading toward him. He didn’t even have time to turn his head when the water/wind hit him and his cart sailed 100 feet through the air, dumping him unceremoniously near the marsh and then landing in the trees, where it still resides. He staggered up the hill toward the barn, dodging trees and sparking wires and almost missing the driveway entrance, he was so in shock. Most people have said we need to make a shrine around Travis’ cart, or at least a garden. He has recovered completely from multiple injuries, but is doing well. This is the first long-run tornado in New England in 130 years and let’s hope it’s a good long time before another shows up. We are left with a feeling of sadness to lose most of the lovely pine forest that we have nourished for 20 years and indeed has nourished us in return in providing shade for our perennials. There are some silver linings, though, to even a very black funnel cloud, including being able to control the shade that our woodland plants receive. We also have a lot of firewood and a very nice view. 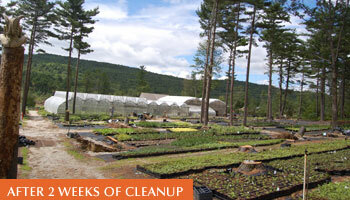 This is a link to a story done on Van Berkum Nursery’s tornado clean-up by NHPTV on their program NH Outlook. This You Tube link shows a slide show, with the first half taken at our nursery and the last half showing some of the house damage just north of us. This final link is a story that ran in the Concord Monitor a few days after the tornado.